Great, look's like we have no secondary again this year. Have to have great offensive output to win games, as we can't rely on the D to stop anyone. Why is everyone saying this? Sure, losing Delmas for the first 1-4 games will hurt, but Coleman lost 7-8lbs this offseason to improve his speed and I'm sure he'll be decent. Our pass YPG given up ranked 9th in the NFL last year before we lost Houston, Delmas, and Berry for the rest of the season in the Green Bay, and just a side-note we didn't allow any points until they were all out of the game. We can still make a move after roster cuts coming up for a #2 cornerback since teams like the Falcons, Texans, Ravens and Giants have lots of cornerbacks and I'm sure at least 1 will be cut. We have $3 million in cap space, so we might even go for Cedric Benson, too. Either way, our defensive line will be even better next year and take lots of pressure off of the back 4 all season. If everyone says our pass defense is so bad, can someone explain how it ranked 9th in the league mid-way through the season before losing 3 key players on it? OK...that defense had all of its starters healthy through those games. What if Delmas' knee issue lingers? Should that happen, it could effectively screw up both safety spots, since once Delmas was out, Spievey became completely lost and went downhill fast. Unless Spievey gets a grip on playing his position without relying on Delmas to cover up for his mistakes, it's a huge loss to start the season with. And despite all the knocks against him, Eric Wright was our best and most consistent tackler in the secondary last year. His pass coverage was spotty, but can we honestly expect anything better out of either Alfonso Smith or a rookie? We don't know just how good Erik Coleman will be in this defense, since last year he got injured early and we never saw him. Based on that, not knowing if Spievey has got his act together, and a big question mark opposite Houston, I'd say it's worth being worried about. I have hope that our corners will play reasonably well as the season progresses and the young talent develops. But in regards to our safeties, we're staring at a glaring hole in our D. Feel Delmas was only adequate (when healthy), and as for Spievey, as I've said previously, wasted draft pick. Lions can't continue to ignore this position on draft day. Believe Mayhew will have to scour the waiver-wire or make a trade to bolster the position. Maybe Silva will step-up, feel he has potential. I think it's fair to say the Lions have ignored the safety position on draft day, but it's not like they've really had a genuine shot at elite talent. The truly elite safety talent usually comes off the board in the first 20 picks, and I have noticed that the dropoff from elite talent to second tier talent is a sheer cliff, not a slight drop. Delmas could be considered a pretty good talent, but he's still not the coverage player I like back there, even when healthy. There was no way for the Lions to know he'd become a china doll in the NFL. Other than that, the Lions haven't had a realistic shot at getting an elite safety over the years. Not every year features elite safety talent in the draft either. Look at the 2011 draft. In reality, there were no top tier safeties available. The Lions have either picked too early to make it a value pick, or too late to get the elite players. Since 2001 they've only drafted four college safeties, with Spievey being moved to safety once he got here. So figure they've drafted five. That's pretty bad. Couple that with the fact that they haven't drafted a cornerback higher than round three since Terry Fair was selected ahead of Randy Moss, and it makes for a shaky secondary built from free agents with few developmental players. •It's only fair to note that after a relatively sloppy practice Wednesday, the Lions came back with a sharp and fast-paced workout held indoors because of rain. The team opened with work on its no-huddle offense, and it set the pace for a crisp day. I like how the Lions' coaching staff sets the pace for high tempo by personally sprinting from one drill to the next. It's tough for players not to follow. •We noted earlier that rookie cornerback Bill Bentley has been elevated to the first team, at least for the time being. The Lions also had veteran safety John Wendling working with the starters, alongside Erik Coleman, while one-time starter Amari Spievey was working with the second and third teams. Coach Jim Schwartz said Wendling has "had a very good camp." He added: "He's knocked down a lot of passes. He's been in the right spot all the time." Look for Bentley and Wendling to start Friday night against the Cleveland Browns. •The practice had some tense moments during one of the final team drills when hot-headed center Dominic Raiola fell, got up and whacked rookie linebacker Tahir Whitehead on the helmet. The two jawed for several more plays but Whitehead did not retaliate, which Schwartz considered a good sign for a team that lost its composure often last season. "The players showed some restraint," Schwartz said. "That's a good step, particularly for a rookie." •Because the practice was held indoors, reporters saw running back Mikel Leshoure running for one of the few times since he strained his hamstring early in camp. (Most of his rehabilitation has been conducted indoors while the team practiced outside.) Leshoure ran hard, with his helmet on, during a sideline session with the team's medical staff. It wouldn't be surprising if he returned to practice sometime next week. •Backup quarterback Shaun Hill had a little fun during second-team work, twice taking option-like runs deep down the left sideline and encouraging defensive players to chase him. I timed his 40-yard dash in approximately 5.01 seconds. 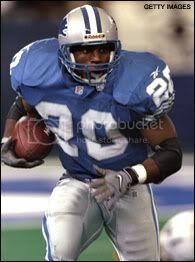 ALLEN PARK, Mich. -- The Detroit Lions improved in each of their first three seasons under general manager Martin Mayhew and coach Jim Schwartz, progressing from 2-14 to 6-10 to last season's 10-6 playoff campaign. So, as they moved through training camp this summer, it was fair to ask: What's next? "Every team wants to be a champion," receiver Nate Burleson said. "But now we just have to prove we can be consistently [good]. That's the most important thing. We're not that team yet that everybody looks at year in and year out and says we're going to be a contender. We don't have the consistency yet to give off that perception to people outside this facility. "We don't want to be the team that falls back and be the team that makes mistakes. We don't want to be that successful team that ends up shooting ourselves in the foot halfway through the season." A few days at training camp revealed the Lions are once again genuine playoff contenders, ones with a structure so routine that coaches had the entire scheme installed in three days. Discussion of an embarrassing offseason has faded, leaving the Lions to focus their attention elsewhere. Mathematically speaking, the next step for this franchise would be a first NFC North title. But the Lions instead have spent the summer working to shore up the flaws that got them bounced from the 2011 postseason. "Our goal is to make the playoffs," quarterback Matthew Stafford said. "Once you get in the playoffs, you've got a chance to be in it and go win it. You've seen that it doesn't matter whether you win your division or not. It's good to be fighting tooth and nail and trying to find a way to get in. Once you get in, anything can happen. We want to go back to the playoffs and do something when we get there." 1. Secondary holes: The Lions had one of the NFL's worst pass defenses over the final six weeks of last season, partially because of injuries to cornerback Chris Houston and safety Louis Delmas. Houston has returned healthy, but Delmas had surgery last week on his left knee and might miss the preseason. Meanwhile, safety Amari Spievey's camp performance has been uneven enough to allow veteran John Wendling to supplant him as a starter. The Lions are also working to find a replacement starter for released cornerback Aaron Berry, and the most optimism-inspiring turn of camp has been the emergence of rookie Dwight Bentley. In all, the project to repair one of the Lions' primary 2011 weaknesses remains a work in progress. "It really doesn't matter what they look like in practice," Schwartz said. "It's how they play in games. These next … preseason games will go a long way toward determining how we feel about those guys and how they practice every day and things like that, not what they've done in the past. We’ve got some quality guys back there." 2. On-field judgment: The Lions' issues with penalties last season have been well-documented, and players said Schwartz has been much more vocal in practice to discourage such easily preventable mistakes. At one point last week, right tackle Gosder Cherilus was removed from a team drill after jumping offsides. "If you do have penalties, you're going to get it," Houston said. "He's going to yell at you." "I think that that's a good step, particularly a rookie like Tahir," Schwartz said, "to be able to show restraint and keep focus even when guys were competing. The biggest thing is not letting those things get a hold of you, and I thought that Tahir did a very good job in that situation." We're not going to declare the Lions a changed team based on one instance when cooler heads prevailed. But camp usually is when the tenor of a team is set. And even if you don't buy that theory, consider it this way: A focused camp where players are concentrating on their assignments is preferable to one where fighting and other chaos breaks the routine. 3. Health at running back: After months of discussion about the potential of a full-strength backfield, the Lions have yet to get Jahvid Best and Mikel Leshoure on the practice field together. Best remains on the physically unable to perform list, still not cleared to practice, and Leshoure has missed most of camp because of a strained hamstring. Leshoure is expected to return to practice next week, but, for now, the Lions' most likely Week 1 starter is veteran Kevin Smith. In many ways, Smith is an ideal option when a team's top two running backs are sidelined. He keeps himself in excellent condition and once again showed in camp that he is well-versed in the Lions' offense. In this era of NFL passing efficiency, any team with a quarterback like Stafford, a receiver like Calvin Johnson and a cast of complementary players at tight end (Brandon Pettigrew and Tony Scheffler) and receiver (Burleson and Titus Young), will be competitive. Just as significant to the Lions' hopes, however, is the consistency of their program. Like Schwartz, offensive coordinator Scott Linehan and defensive coordinator Gunther Cunningham are entering their fourth seasons with the Lions. Special-teams coordinator Danny Crossman joined the team in 2010. That means the Lions have to teach their scheme only to the handful of newcomers they welcomed onto their roster and can spend more of training camp focused on higher matters. "It's tough for a rookie, probably, to jump in," Stafford said, "but the whole playbook is in about three or four days. We have a lot of returning starters who know what to do, and it's on the rookies to pick it up along the way." Schwartz noted that there are always new wrinkles to work on and adjustments to make, but added: "Our first day of training camp, if we had to go play a game, we probably would have been able to call an entire game on offense, defense and special teams. It gives you a little more leeway. You don't have to start over and you don't have to put things in." Detroit is a good, playoff-caliber team that plays in what might be the NFL's toughest division. Nothing I saw at training camp pointed to anything other than continued progress toward elite status. The Lions' biggest problem is that they will fight for a playoff-caliber record in a division that contains two similar teams, the Packers and Bears. The Lions are 2-10 over the past three seasons against the Packers and Bears. Conventional wisdom suggests they will have to beat out at least one of those teams in the NFC North standings to earn a second consecutive playoff berth. It seems odd to move through a training camp snapshot without much mention of the player who last year had one of the best seasons for a receiver in NFL history. Johnson looked, well, like Johnson -- a man among boys. Earlier this summer, Burleson said he thought Johnson looked stronger and faster than ever. When I dipped into a media scrum surrounding Burleson's locker last week, he was suggesting that Johnson could outrun Olympic gold medalist Usain Bolt if he trained as a sprinter rather than a football player. I'm not sure whether Burleson was joking. We're almost numb to seeing Johnson make inhuman catches, but we're still getting used to the third portion of the Lions' trio of top receivers. Young, by all accounts, has had an excellent camp. Thursday, I watched him meet a low throw in textbook fashion, snatching it with both hands just before it hit the ground. By grabbing the ball and not diving, Young stayed on his feet and used sideline footwork to earn a first down. "He's always been a very skilled player," Schwartz said. "Very good hands. He's an important player in our offense. … He's a guy that missed all of training camp last year. He had very, very few practices. So this is really his first training camp. We are seeing good signs from him but also continued development. It's not just flashes. It's been a lot more consistency." The Lions are still working through options to find the best place for second-year defensive tackle Nick Fairley, who is spending time at defensive tackle and at defensive end in a new "Grey" scheme. Fairley is fully healthy for the first time since breaking his foot last August. When I asked Schwartz whether he has seen the player the team thought it had when Fairley was drafted, he said: "I don't want to read too much into practice. He's running well. He's strong. He's still developing in our scheme. This is a very important preseason to evaluate him. Last year, even when he was playing with us, he was never 100 percent. He is now, and this will be a good preseason for him to show that." We have often joked in our SportsNation chats about the relative lack of recognition Stafford received after a 5,038-yard, 41-touchdown season. So I laughed when, asking Stafford whether he had allowed himself a moment to feel good about a 5,000-yard season, he said: "I mean, it means nothing at all. Shoot, I don't even think half the league even knew it happened. It doesn't matter to me." Familiarity with Linehan's offense provides at least one advantage: Players are more likely to know multiple positions, allowing them to rotate more often and minimize defensive adjustments. "At this point," Burleson said, "we know the offense and we know each other's positions. Now we can make it even that much more difficult to guard us by moving [Johnson] around, moving myself around, moving Titus around, so you can't look at the depth chart and know where we're going to line up day in and day out." Rookie first-round pick Riley Reiff got some first-team work at left tackle, where he probably will replace Jeff Backus one day. But there are no indications that Cherilus is in danger of losing his job, giving the Lions a better backup option than most teams have if a starting left tackle or right tackle is injured. The Lions are hosting a punting competition for the second consecutive season, but no favorite has emerged. Ryan Donahue, who opened last season as the Lions' punter, is competing against the player who replaced him after a quadriceps injury, Ben Graham. It wasn’t that long ago that Everette Brown was worth a first-round pick. Now he’s on his third team in a calendar year. But with a strong showing in his first preseason game, Brown’s hoping to make a name for himself with the Lions. He had 1.5 sacks and hit the quarterback four times against Cleveland Friday. “I really can’t put my finger on any issue there,” Brown told Carlos Monarrez of the Detroit Free Press. “But one thing’s for sure, it’s been a learning curve for me throughout my career, especially this last year. Once upon a time, that level was viewed differently. Desperate for a fallback plan for the soon-to-be departing Julius Peppers, the Panthers traded a 2010 first-round pick to take Brown 43rd overall in 2009. But the spin move that made him a successful pass-rusher at Florida State never translated, and when Ron Rivera took over the Panthers in 2011, Brown was cut after two uninspiring seasons (6.0 sacks). He signed with San Diego in November, but cut in March when the Lions gave him another chance. After bouncing between a 4-3 and a 3-4 and back, he looked more comfortable Friday. While he said his weight was the same (260-ish), he looked sluggish in 2010 when he bulked up to try to play the run better. Between Cliff Avril, Kyle Vanden Bosch and Willie Young, the Lions have a solid base of talent at defensive end. Tapping into Brown’s talent would give them a bonus, at a time when Brown’s first team doesn’t have nearly enough players who can get to the quarterback. man are we becoming the land of opportunity for misfit previous first rd busts or what? Isn't this the year they expand the rosters by a couple of players? Or is that next year? KVB is one of the last people I'd want cut. He may be getting old, but he is pretty consistent and still a decent starter, but mainly because of his leadership. This team is still young and immature. The only way I'd want any of our D-ends on the roster to leave the team is by trade, and Cliff will likely have the highest value if he is traded. Patriots with Devin McCourty, Browns with Joe Haden (who got into trouble lately), New Orleans with Jabari Greer, and Tampa Bay with Aqib Talib are all teams with struggling pass rushes with corners who could possibly be part of trades for Cliff. Getting any of these guys would be GREAT. Ronnell Lewis will stick around before Brown since he's a draft pick, cheaper and wouldn't last waivers. Flu is the one that's expendable especially since Fairley is healthy now. Makes more sense to keep the extra DE then DE/DT combo. Flu falls behind both Lewis and Brown at the DE spot. Cliff, LJ and Young are all FA next season, so Lewis gives security incase any of those don't resign.